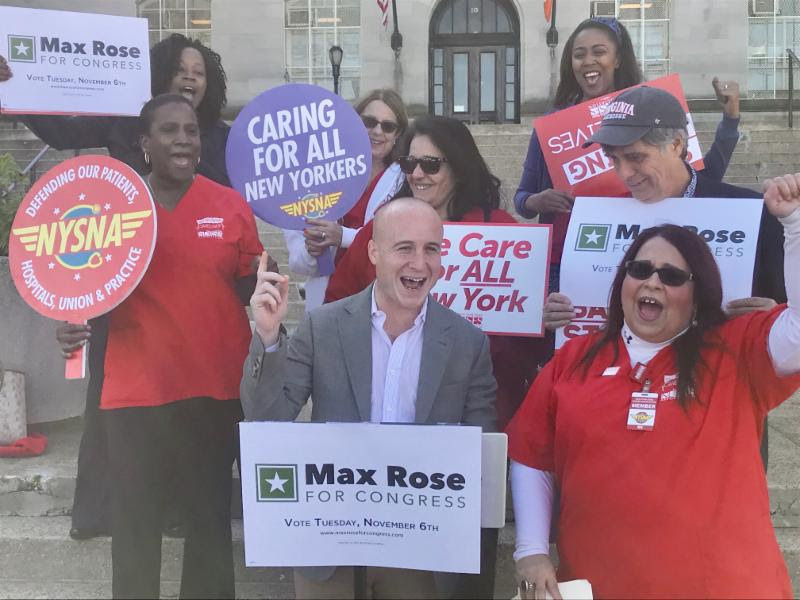 STATEN ISLAND – Today, members of the New York State Nurses Association (NYSNA) gathered in front of Borough Hall to endorse Max Rose, the Democratic Congressional nominee for NY-11 and discuss the urgent need to focus on fixing the country’s health care system rather than tear it apart. “The nurses of the New York State Nurses Association, many of whom either work or live in the district, are very proud to endorse Max Rose. He has a keen awareness of the health care needs of the communities he will serve and will fight in Washington to preserve funding for health care, with special regard for the under-served. Max Rose understands the critical importance of the battle being waged to support equality in health care services,” said Pat Kane, RN, NYSNA Treasurer. NYSNA’s endorsement comes two days after Max Rose revealed that incumbent Dan Donovan voted against the CREATES Act, a bill that would have increased competition in the prescription drug market and significantly lowered our prescription drug prices. The bill was co-sponsored by Ted Cruz and Rand Paul and was supported by committee staff in both chambers. However, between January and March of 2018, the largest drug lobby group in America spent $10 million to fight against the motion and successfully eliminated bipartisan support. In breaking their own record for the most spent in a single quarter, Big Pharma stalled a bill that was intended to increase competition among generic and branded drug manufacturers. NYSNA is a union of 42,000 frontline nurses standing together for strength at work, their practice, safe staffing, and healthcare for all. They are New York’s largest union and professional association for registered nurses. The Staten Island Democratic Party, The Working Families Party, The Women’s Equality Party, President Barack Obama, Vice President Joe Biden, U.S. Senator Kirsten Gillibrand, Governor Andrew Cuomo, NYC Comptroller Scott M. Stringer, NYC Councilman Justin Brannan, NYC Council Members Mark Treyger and Debi Rose, NY State Assemblyman Peter Abbate and Michael Cusick, Senator Diane Savino, Jr House Minority Whip Steny H. Hoyer, Rep. Joseph Crowley, Rep. Seth Moulton, Rep. Ted Lieu, Rep. Eric Swalwell, Jason Kander, The Planned Parenthood Action Fund, End Citizens United, Future Forum PAC, VoteVets, With Honor, Blue Dogs PAC, BOLD PAC, NARAL, NewDems PAC,, The Stars and Stripes Democratic Club, The Bay Ridge Democrats, The Brooklyn Young Democrats, Indivisible Brooklyn, The Muslim Democratic Club of NY, The Lambda Independent Democratic Club, The Jim Owles Democratic, and The Central Brooklyn Independent Democrats.